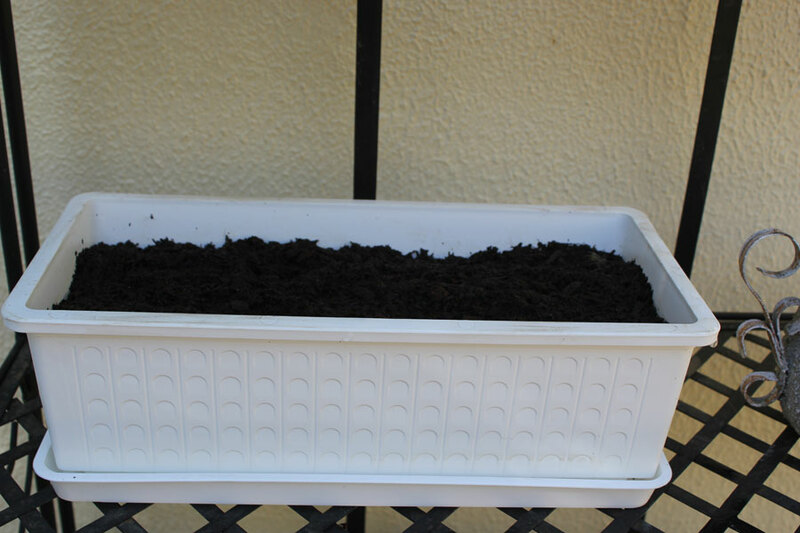 Today I thought I’d try something that I’ve been purposely avoiding … planting seeds. I’ve never planted seeds before in my life – and fear of failure and thereby revealing a serious lack of “green-fingerness” has kept me from trying this. (I do recall planting beans on cotton wool as a child but that’s as far as it went – I have no recollection of what happened to the beans after they sprouted – I’m guessing they died). It all went quickly and easily – not too much mess, no fuss. 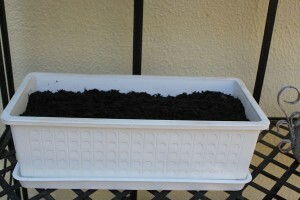 I covered the planter box drainage holes with stones, added the compost to the plant box, firmed it down to get rid of air pockets and then took the seeds out of the packet, spaced them equally around the planter and then covered them with a 4mm layer of compost. Firmed it all down again, placed it on my plant shelf and gave it a good watering. 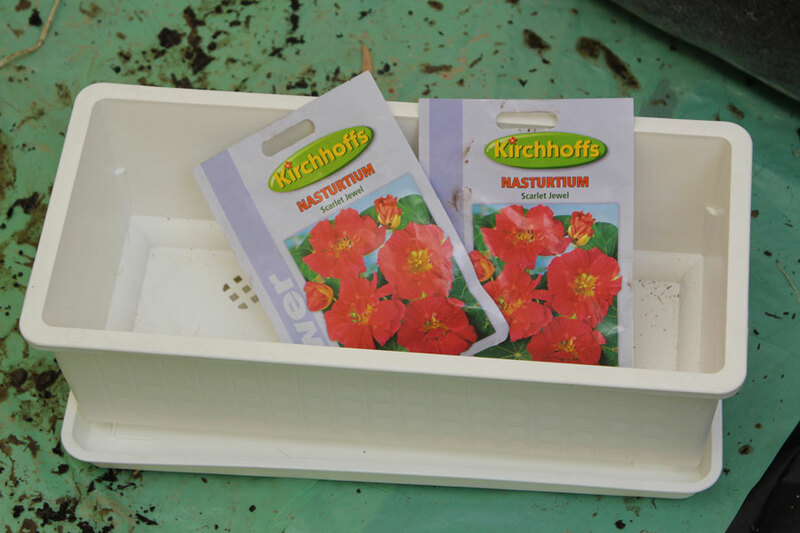 The packet says to keep the seeds moist whilst they germinate and that germination takes six to ten days. We shall see … this better work or I will be mortified! I’ll report back in 6 – 10 days, hopefully with sprouting nasturtiums! Any advice on how to complete project “Christine plants seeds” successfully, will be most appreciated! 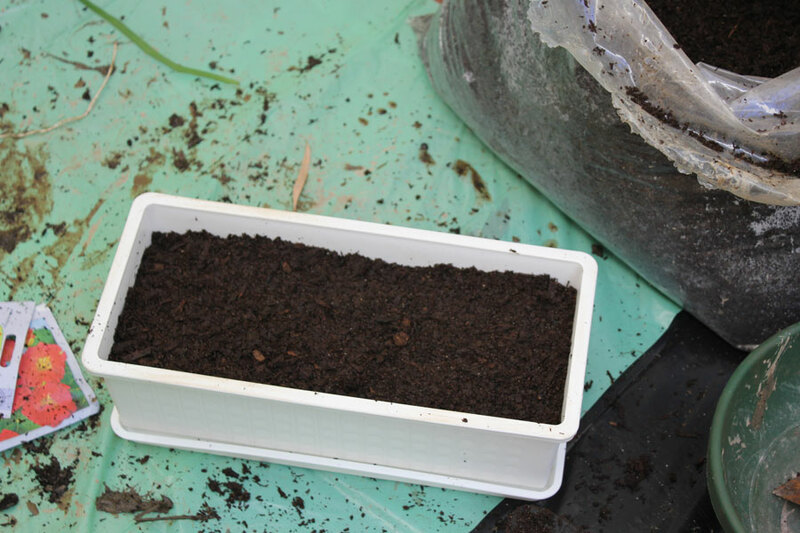 seed planting update – day 7: 10 seedlings emerge! Christine, Whether your seeds be big or small, please don’t plant them too close together or you’ll spend the rest of spring replanting seedlings – my lesson learnt from last year. It always seems, where seeds and I are involved, that if I care about the outcome-its bad. Bad, bad, bad. But if I just throw some down and say heck with it, I get a wonderful surprise. Nasturtiums tend to be a bit “weedy” if you don’t watch out. They took over a whole bed in my garden – we had to rip them all out because they were suffocating everything else. Good luck with the seeds though – should be fun to watch them grow. Instructions are for babies!… Erh… What I mean to say is, I often get over-excited and forget reading instructions, but I guess that’s inevitable when amateurs become passionate about something. I hope your nasturtiums will do you proud, though; sowing your own plants just makes it so much easier to fill your garden with pretty plants without breaking the bank. Haha, I agree – instructions are for babies, thats why I never read them BEFORE the task. Best wishes on your seed planting! There is something magical in seeing little seeds sprout. I love nasturtiums. They should look great in your planters. Thanks Debs! I like Nasturtiums too though they do tend to get out of control if left to their own devices. At least thats my experience here in my garden. I’m excited to watch your seeds sprout and grow. I love watching mine and hopefully this year they will all do ok with the transplant. I was wondering, does it matter how many seeds you put in the planter box? The more the merrier? or follow the packets and still plant with the spacing recommended? Hi Heather – I really don’t know how many seeds could or should go in the planter box – I think most people just scatter them and thin them out once they sprout. I spaced mine a few centimetres apart but will transplant them once they have established themselves. Good luck with your seeds! I think that’s part of the joy of gardening – there’s always something new to try and to challenge us! Well done Chris!! It is quite a step to get the growing from seed right everytime. I don’t think even the experienced gardener get’s it right everytime. I personally prefer to grow from seed. I feel I am part of the whole process when I do that. It is a great feeling to see those first shoots breaking the surface. I am sure you will also jump for joy, like me, when you experience it!! Have fun and let me know IMMEDIATELY when you see the first shoot!! Hi Christine, This is the first year in forty that we have not planted seeds, it feels like freedom. Nasturtiums as you have probably found out are a hardy annual and in your part of the world in particular should be sown directly outside as you found out. If I were you I would rummage around pick out the seeds and start again. Other seeds where you find that they should be started in seed trays! they really do not need the drainage holes covered. Gosh am I sounding like a smart arse, I really don’t know everything about gardening, just that I enjoy it. don’t be too hard on yourself..I am still learning the tricky art of seed planting…some of us have it down pat and some of us (me) still struggle to get it right…some successes and some failures…I start mine indoors with a heat pad and grow light which has helped my success a bit…I just planted some seeds this weekend and we shall see…good luck!! Thanks Donna! I hope both yours & mine turn out ok.